For designers and developers that frequently work with WordPress, theme frameworks will give you a noticeable improvement of efficiency. Theme frameworks will help you to eliminate some of the repetitive work that you probably do with each custom theme. In this post I will explain the advantages of using WordPress theme frameworks and we will have a look at 5 most popular theme frameworks. A theme framework is a ‘drop-in’ code library that is used to facilitate the development of a theme. A framework is basically a theme ‘on steroids’ that is designed to be a strong foundation that can serve as a parent Theme for building Child Themes. A theme framework provides a lot of useful features that are quickly available and easily customizable based on your needs. Let me explain it using an example. Consider a car. Your WordPress installation, the thing which powers your website, is the engine of the car. The theme framework is the body of car and the child theme does the paint job. When you design a WordPress website using a theme framework you will need two things – a Parent Theme and a Child Theme. A child theme is a theme that inherits the functionality of another theme, which is the parent theme, and allows you to modify, or add to, the functionality of that parent theme. Most of us like to do a complete redesign of our website once in a year or two. But trust me, switching themes is not easy as you think. But with Theme Frameworks it is very easy to switch the design of your website. Since the core settings are in a Parent theme, switching the child theme won’t affect any critical settings like SEO. Theme frameworks drastically reduce the development time. 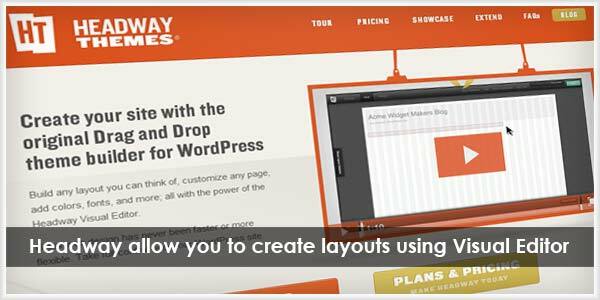 If you are theme developer and develop WordPress themes for your clients frequently, you will probably be fed up of all the repetitive tasks like code writing and frequently checking your mark-up. A framework is designed to make the process of designing and coding a WordPress theme by reducing your time, on WordPress’ back-end code that is repeated within every theme. You don’t have to start from scratch, and frameworks give you a very strong and a good base to start from. By using a theme framework you can stop worrying about a WordPress update breaking your theme. Developers updates their frameworks as WordPress evolves so your site can stay updated with latest version of WordPress. The ability to upgrade without losing any styling functionality of child themes is a great plus. Theme frameworks have the benefit of being of being tried and tested on many websites, which will reduce the amount of trial and error you will have to perform to fine-tune your theme. These tests will help the developers to fix the security loopholes in the framework and thus give you a more secure website than the one you create from the scratch. Most theme frameworks will have a smart design architecture which will make it easy for the search engines to see your content. 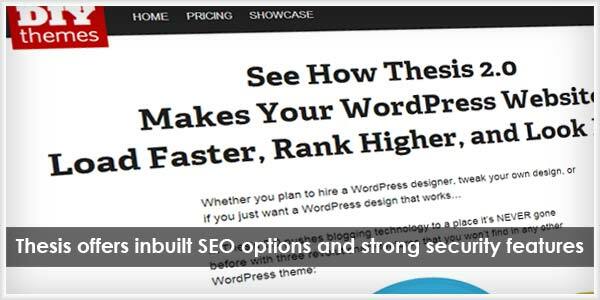 This will help you to avoid the need of additional SEO plugins. Most popular theme frameworks have a huge community behind it. This makes it much easier to get your support questions answered. Is there any disadvantages in using Theme Frameworks? A disadvantage of using frameworks is at the beginning, where there is always going to be a learning curve as you adopt new stuff to your development workflow. Most theme frameworks have its own hooks and filters. So you will have to get familiarized with the framework lingo at first. What are the popular Theme Frameworks? There are dozens of theme frameworks available out there, both free as well as paid. I am listing some of the popular frameworks below. I am not listing specific features of each framework in detail because it will make this article too long. So to learn more about each framework, check their official websites. 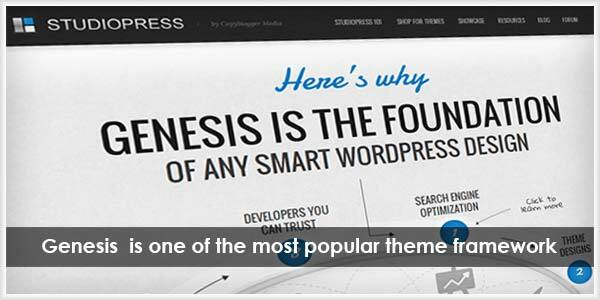 Genesis, built by StudioPress is one of the most popular premium theme framework. Genesis has built in features for SEO, supports custom widgets and layouts and offers unlimited support and updates. Genesis has a marketplace where you can buy additional child themes or you can get a web developer for creating a custom child theme for your need. Genesis license costs $59.95 and you can use it on unlimited websites including yours as well as clients. Thesis, by DIY Themes is another theme framework used by many popular blogs and websites. Thesis offers inbuilt SEO options, strong security features and quick support through the forum as well as telephone. There are two licenses, with the less expensive one only allowing use on a single website and the developer license that can be used on an unlimited number of your own sites, with additional license fees for use on client websites. As you can see Thesis costs much more while compared to Genesis and you will have to purchase additional licenses while you want to use it for your client sites. So unless the client specifically says Thesis as his requirement personally I always choose Genesis Framework over Thesis. Thematic is an open source, SEO-ready, highly extensible, WordPress Theme Framework featuring 13 widget-ready areas, drop-down menus and grid-based layout samples. Due to the limited number of available ready-made child themes, ordinary users who only want to use ready-made themes might not want to go with Thematic. But if you are a WordPress developer looking for a free theme framework then Thematic will be an excellent choice. ThemeHybrid is a popular, free framework developed by the equally popular WordPress developer, Justin Tadlock. ThemeHybrid is free, but to get support on its forums, you need to sign up for an Exclusive Membership to their Theme Club, which is $25 per year. I hope that this article helped you to understand more about theme frameworks, and whether you should use it or not. Are you already a user of theme framework? Which one are you using? Let me know about it in the comments. Looking forward to seeing your responses.